If you’re wondering whether you should visit Spice Route Estate, the answer is yes, definitely. Some may think it is tourist oriented, and it may well be but locals will enjoy spending some time there too. Read on to find out why. Spice Route estate is the old Siedelberg estate, next door to Fairview. It was taken over by Fairview and revamped before opening to the public in early 2012. New elements have been added to the offering over the months, so that it is now a one stop winelands destination. I’ve selected some photos for this article but there is a link to more photos at the end of each section. Thanks to Lauren McCarthy for assistance with photography. Spice Route wines are made from grapes from Malmesbury and West Coast. The first vintage was in 1998. The extensive range now boasts a sauvignon blanc, viognier, chenin blanc, syrah, mourvedre, pinotage and shiraz. In addition, there are two blends, the Chakalaka and the Malabar. There is plenty of space for wine tasting at Spice Route. In winter the tasting room on the old cellar is a cosy option, and on fine days the covered veranda or the sunshine-bathed grass will be appealing options. Enjoy a standard tasting (R25) of 6 wines or the full food & wine experience (R90) which includes tastings of all 9 wines plus food pairings. We were really impressed with the quality of the wines. The 2007 syrah was definitely my favourite though. Additional photos of the wine tasting available here. There are several food options at Spice Route. The main option being the Spice Route Restaurant. While the restaurant is not formal by any means, this is the most sophisticated food offering on the estate. The menu selection has a hint of local influence with dishes such as grilled ostrich fillet topped with mozzarella cheese, served with a plum tomato and aubergine compote, oven roasted Portuguese baby potatoes and rocket pesto (R136) and Cape Malay vegetarian bobotie with baked basmati rice and mango chutney (R112). Other options include Groeneveld duck breast (R142), Chalmar beef fillet medallions (R144) and fresh line fish rice paper spring roll (R132). If you’re looking for something a bit more casual, then the pizza and flammkuchen offering at Wilderer’s Distillery will be just what you need. Those who live in the area will be familiar with their other popular restaurant, Pappa Grappa which serves pizza & flammkucken in addition to other Italian influenced options. We didn’t get to try the pizzas, but I have no doubt they are fantastic. 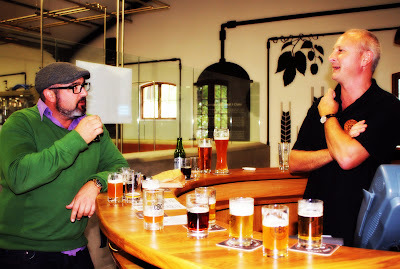 Finally, one can also order from the simple menu at Barley & Biltong Emporium, the casual ‘beer hall’ on the farm. Wilderer’s was the first commercial, hand crafted distillery, operating since about 1995. 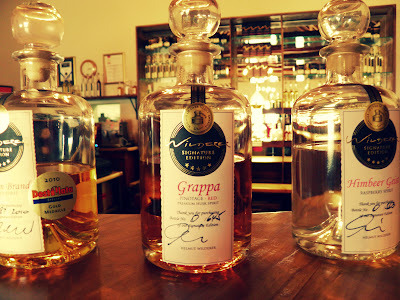 The range of grappa and schnapps has expanded over the years and the offering is replete with choice and quality. They have installed a small still in the venue and if you’re lucky, you’ll be able to see the distilling process happening. But either way, you’ll have the opportunity to taste and purchase some very fine and interesting grappas and schnapps. Half of the space is dedicated to their restaurant, which is a casual spot with a fantastic view. The food is a simple but tasty offering of pizza’s and flammkucken. A perfect option for those wanting a casual, inexpensive lunch. For women, this is the highlight of a visit to Spice Route (men might want to skip to the next section on the brewery, although I really enjoyed the chocolate experience too). The chocolate is delicious! One of the few bean to bar micro chocolate producers in the world, the De Villiers family source the finest cocoa beans from all around the world. You can watch the production process as the facility is separated from the tasting room by glass. The tasting experience is memorable to say the least. You will be given the opportunity to compare the chocolates made from beans from various parts of the world. Choosing a favourite is difficult because they are all so delicious. The Café range is easier to choose between because people either enjoy or don’t enjoy flavours like rooibos, salt, coffee, etc. 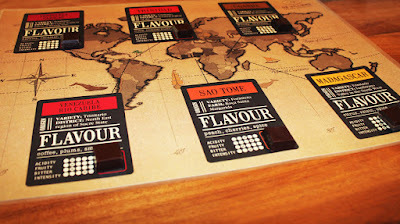 The tasting pack is an awesome purchase because it makes a perfect gift, if you don’t eat it first! Also, try the chocolate espresso in the coffee shop. It’s basically just melted chocolate, otherwise known as heaven! Beer lovers in Cape Town have been waiting for this impatiently. 4th generation master brewer, Wolfgang Koedel (ex brewer at Paulaner in the Waterfront), is in charge of this little gem. I call it little, but it is nearly 15x the capacity that Paulaner was, and includes a bottling line! The CBC range includes a pilsner, lager, krystal Weiss, amber Weiss and ‘Devil’. There are several tasting stations so you won’t have to wait long to get stuck in. Don’t be surprised if you see pallets of other craft beers such as Jack Black because CBC brews for other craft labels too. You may be thinking that’s a broad offering at Spice Route Estate, and you’d be right but there is more. If you had visited Siedelberg back in the day, you would remember there was a glass blower there. Well that is still there so if you time it right you can see a glass blowing demonstration, before browsing the beautiful products available in the shop. A fine ending to a visit to Spice Route, or perhaps a destination itself, is Barley & Biltong. This ‘beer garden’ offers a casual snack menu as well as an extensive biltong menu, all washed down with CBC beer or Spice Route wine. You can also choose to do a biltong tasting, and enjoy a taster of various biltong meats. 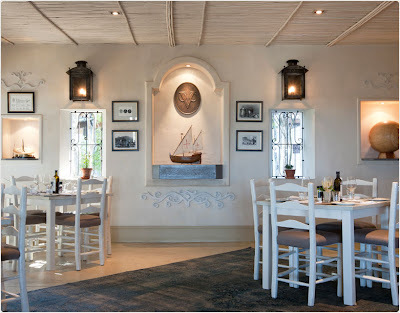 As you can see, the offering at Spice Route Estate is extensive and there is something for everyone. It’s a perfect place to take tourists but it’s a fantastic day out for locals too. We arrived mid-morning and left at about 5pm and we were not lingering as much as we would have liked. I recommend you make a plan to visit Spice Route Estate as soon as possible.